The message of the Stabat Mater focuses on the spiritual and emotional bond which unites Mary and all Christians to the death of her Son on the Cross. The hymn Stabat Mater originated with the Franciscans in the 13th century. It is based on Simeon's prophecy (Mark 2:35) and is most frequently used with the Stations of the Cross. A powerful chaplet, with ten large 18mm tears of faceted lapidolite --- one for each stanza --- swirling with mournful colors . The chaplet is completed with a richly-detailed bronze icon crucifix, featuring the crucified Christ on one side, Madonna on the other, both surrounded with angels and saints. Lo! the piercing sword had passed! In so great a sorrow bowed? 'Mid the fierce, unpitying crowd? Love to read in every Wound. Let me share them both with thee! May I at the judgment find. There confess me for Thine own. Christians of the 20th century can truly identify with Our Lady's experience of Sorrow. The message of the Stabat Mater focuses on the spiritual and emotional bond which unites Mary and all Christians to the death of her Son on the Cross. From this bond, each Christian can recognize the incredible compassion and holiness in Mary's character. The Blessed Mother demonstrated her maternal compassion to all generations of Christians by her presence and participation with her Son Jesus in the Sacrifice of the Cross. There is a mother - son bond that unites Mary with Christ Jesus during his experience of suffering and death. This empathetic bond indicates that Our Lady shared in her Son's suffering. Mary is Our Lady of Sorrows precisely because her Son Christ Jesus bore the sins of the world during his passion and death. As the faithful disciple, Our Blessed Mother invites us to unite our personal suffering with her own. 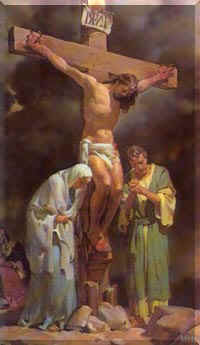 We can share in Jesus' burden on the Cross, just as Mary did at Calvary. As Our Lady of Sorrows, Mary also reminds us that Christians are called to expiate for his or her own sins and the sins of their neighbors, and the sins of the world.. We can share in the bond between the Blessed Mother and Our Lord through fasting, prayer, and contrition for sin. Our Lady of Sorrows teaches us that the Crown of eternal life in Heaven can be reached when we each choose to share with Our Lord in His suffering and death on the Cross at Calvary. The compassion of Mary is part of the mystery of the Church community's sharing in and offering in the Sacrifice of Jesus for the salvation of the world. Each member of the Church has a role to play in redeeming the world. Our Lady of Sorrows is a guide who inspires and teaches us how to be compassionate. Now that we have explored some of the contemporary meaning of the Stabat Mater , let us summarize the hymn's important history. Tradition has identified the hymn with St. Bonaventure, Jacopone da Todi, and Pope Innocent II. A notable number of scholars point to da Todi as author, since two 14th century codices and the 1495 edition of the sequence attribute the hymn's authorship to him. While it cannot be denied that the composition's general tone and sensitivity parallel that of da Todi's poems, strictly stylistic comparisons yield but uncertain and even disputable results. Recent scholars like L. Russo and M. Cassella are not impressed by the arguments in favor of Jacopone's authorship. The Stabat Mater has two qualities that most scholars date from the 12th century: an intricate rhyme scheme and a regular meter (usually trochaic). The Stabat Mater was introduced into the Liturgy gradually until 1727 when it was prescribed as a Sequence for Mass of the Seven Sorrows of Mary on September 15 and on Friday before Holy Week, as well as their corresponding offices. The Stabat Mater has been retained as an optional Sequence for September 15 in the reformed Roman Missal and as the hymn for the Office of Readings, Morning Prayer, and Evening Prayer in the new Liturgy of Hours. The Stabat Mater's popularity is reflected by its use in the popular devotion of the Stations of the Cross. During the 16th century, the sequence motet was a favorite form among important musical composers. The Stabat Mater was frequently given elaborate polyphonic settings. A model of such settings is Palestrina's famous Stabat Mater which employs two choruses and combines several couplets to suggest larger musical units within the total composition. During the 17th and 18th centuries, the Stabat Mater inspired large works for chorus and orchestra. The hymn's text was divided into a number of autonomous and differentiated movements. Compostions of this type were those of Seffani, A. Scarlatti, Pergolesi, Boccherini, and F.J. Haydn. During the 19th century, the popularity of the Stabat Mater's text is evident by its place in the work of Verdi, Rossini, Schubert, and A. Dvorak. las llagas de tu Hijo. por amor a Tu Hijo. que es tu paraíso. Amén.